Atlantic naval territory of Guinea-Bissau. After a day’s voyage, this distant water fishing ship has reached an operational region, and the sailors are preparing to fish using a cantilever sheet trawl, which catches marine life indiscriminately. Photo: Liu Yuyang / Greenpeace. China’s distant water fishing industry is now the largest in West Africa, with more than 400 fleets operating, producing a £340 million catch every year, according to documents published by China’s Ministry of Agriculture. The majority of the boats use bottom trawling, an extremely destructive form of fishing which catches anything in its path – and a major reason for the depletion of fish stocks in China’s domestic seas. Greenpeace commissioned a photographer to spend a month on boats and land in west Africa, documenting an industry that appears poorly regulated – and the lives affected by it. Guinea-Bissau. Chinese and local sailors work together cleaning and sorting the catch. Photo: Liu Yuyang / Greenpeace. In May 2015 Greenpeace exposed 74 Chinese distant water fishing vessels for fishing in prohibited waters and falsifying their vessel tonnage. 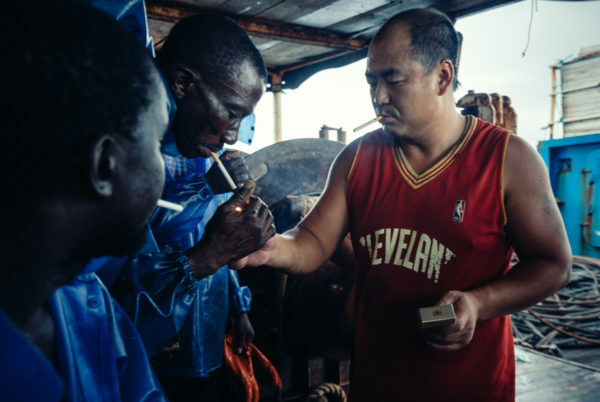 Between 2001-2006 and 2011-2013 a total of 183 ‘illegal, unreported and unregulated’ (IUU) cases involving Chinese vessels in west Africa were documented. Senegal. 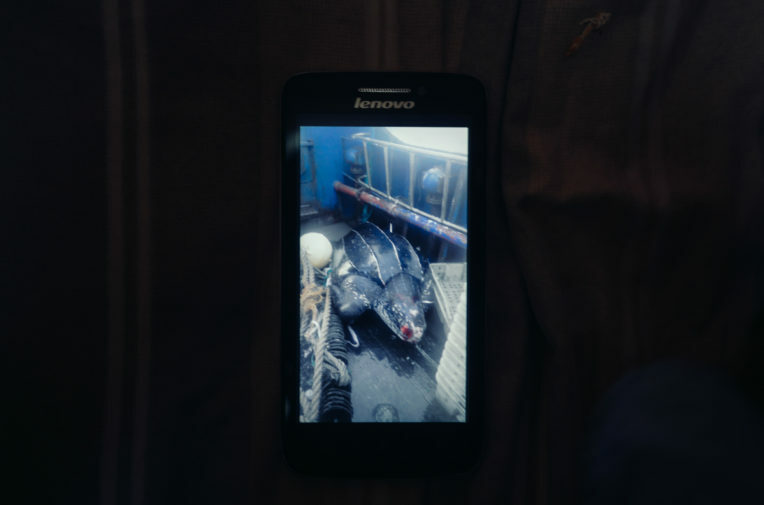 One of the sailors shows a picture on his cellphone of a leatherback sea turtle (Dermochelys coriacea) he once caught. Leatherback sea turtles are the largest sea turtles in the world, a vulnerable species listed in Appendix I of the Convention on International Trade in Endangered Species of Wild Fauna and Flora (CITES). Photo: Liu Yuyang / Greenpeace. 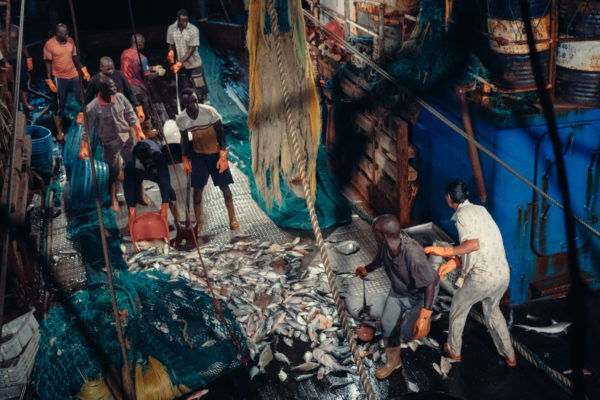 The seas around the west African coast are some of the richest in the world, attracting a global industry that provides 3.6 million tonnes of fish every year. Since the 1950s, a total of 47 nations have had distant water fishing operations in the area. Over 70% of China’s boats in Africa are harvesting the seas off the coasts of Senegal, Mauritania, Guinea Bissau and other west African countries. 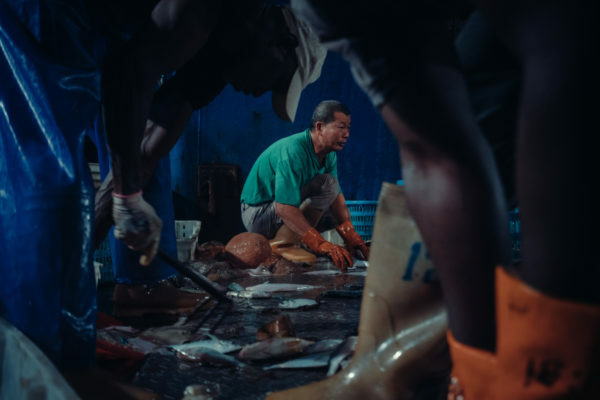 Decades of intense exploitation of west Africa’s seas, by all nations operating in the area, have resulted in over 50% of fishing resources being overfished. Guinea-Bissau. 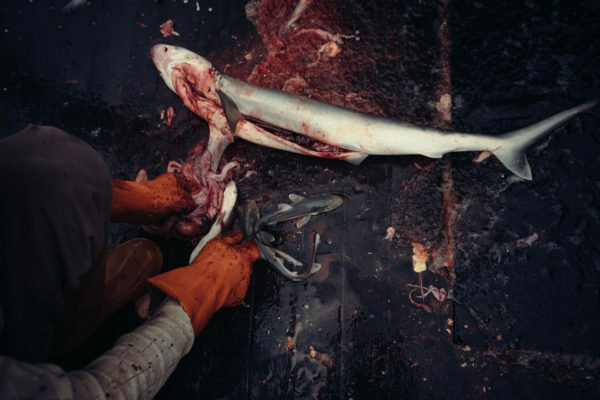 One of the sailors is cleaning a pregnant milk shark (Rhizoprionodon acutus) that was just caught. After cleaning, they are frozen and then end up on the dinner tables of Africa, Europe, or China. Photo: Liu Yuyang / Greenpeace. Dakar, Senegal. Senegalese and Chinese sailors look across the water at each other as their ships leave harbour. Photo: Liu Yuyang / Greenpeace. The arrival of the Chinese fishing industry has also had a big societal impact on west African countries. First of all, 70% of Senegalese animal protein intake comes from fish. So any depletion in stocks has an impact on the Senegalese diet. Secondly, Chinese boats have become both a source of competition and a source of better paid employment for the local fishing industry. Guinea-Bissau. The Chief Mate hands out cigarettes to local sailors. Photo: Liu Yuyang / Greenpeace. Senegal. 34 year-old Chief Engineer Shi, who has been working in far off waters since 1998, is calling his relatives in China. Photo: Liu Yuyang / Greenpeace. 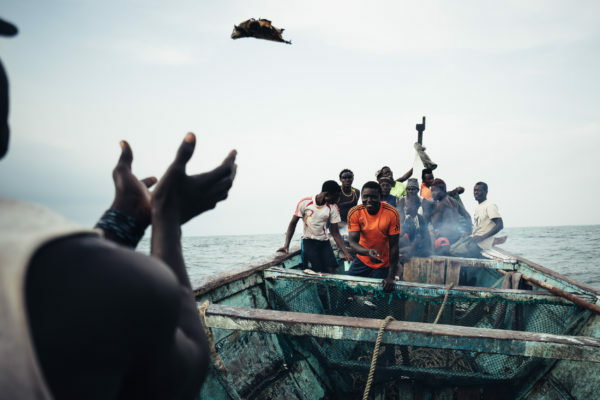 In Senegal, a total of 15% of the working population work in the fishing industry. Of these 100,000 workers, 90% work in traditional artisanal fishing. 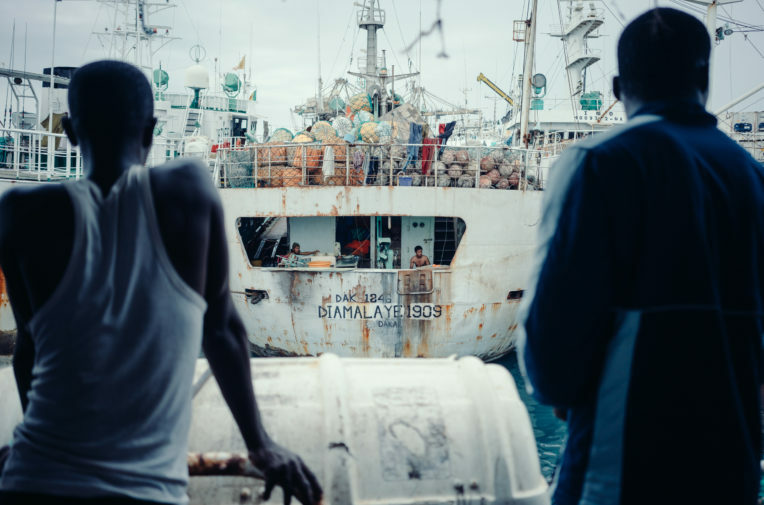 As fish stocks have come under greater pressure from foreign distant water fishing vessels, these fishermen have been forced to travel further and further out to sea to make their catch. The remaining 10% of the Senegalese workforce employed in the fishing industry work on foreign distant water fishing boats. Here they earn a comparatively high wage of up to CFA Franc 100,000 (£129) per month. Senegal. On a small-scale, artisanal vessel, a fisherman throws a roasted fish to his shipmate. Fish is the principle source of protein in Senegal. Photo: Liu Yuyang / Greenpeace. Senegal. 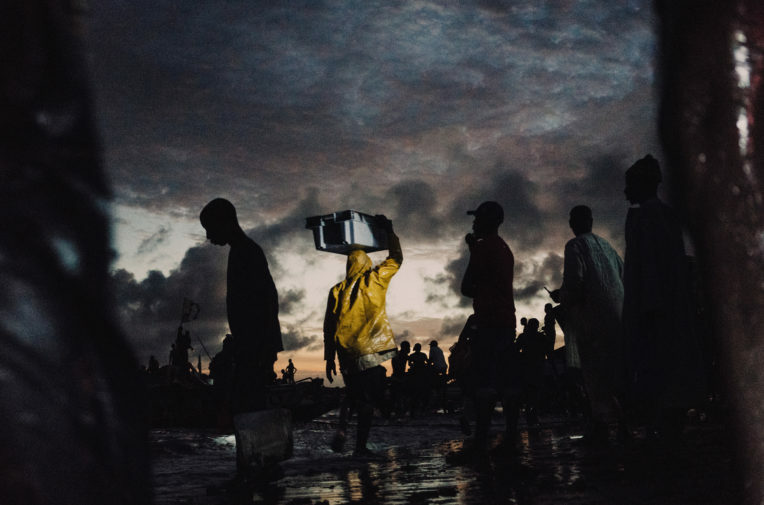 As night begins to fall, the small-scale artisanal fishing boats are returning to shore to sell their catch. Photo: Liu Yuyang / Greenpeace. Chinese fishermen are also attracted to their country’s distant water fishing industry by the comparatively high salary. 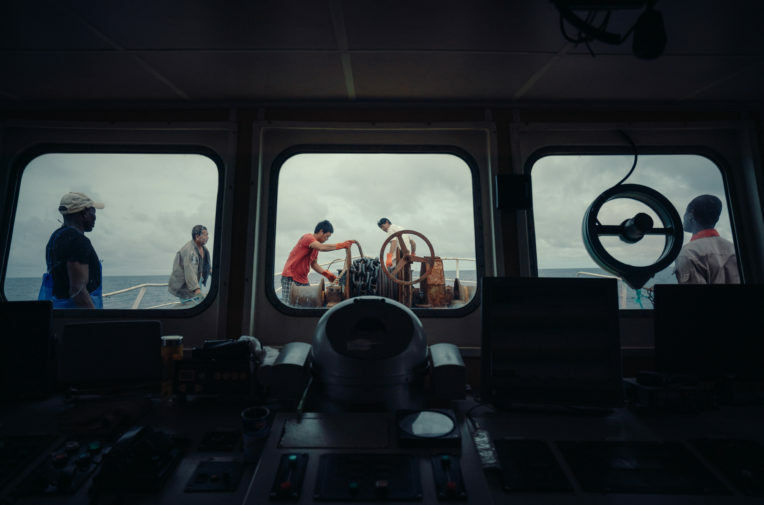 Staff aboard a China Fujian Distant Water Fishing Ship typically earn between RMB80,000 to RMB300,000 (£9,300 to £35,000), substantially higher than a typical wage of RMB50,000 to RMB200,000 (£5800 to £23,000) in China’s domestic fishing industry. Of the 20-man crew, seven are Chinese and 13 are from local west African countries. The fish industry is not only confined to the sea, however. Demand for fish meal, used as animal fodder and feed for aquaculture and industrial farming, is booming in China, driven by the growing global meat industry. Fish meal companies are attracted to Mauritania due to the government’s encouragement of the industry and the region’s sardine resources, a protein-rich fish which is ideal for fish meal. 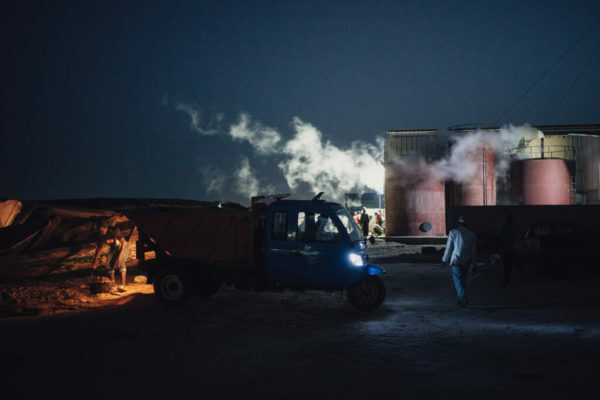 The Lem Fishmeal Factory in Nouadhibou, Mauritania’s second largest city, is one example. 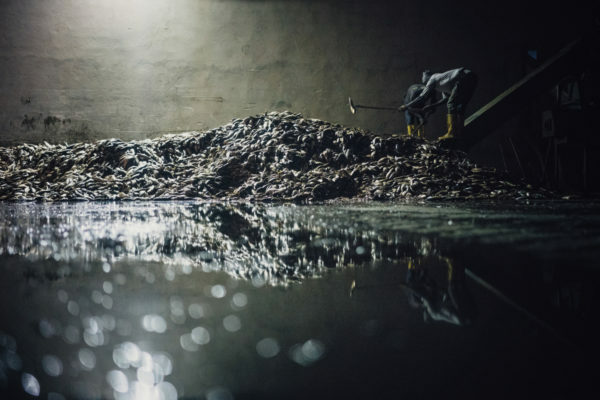 It is one of at least 20 fish meal factories in the town, half of which are Chinese owned. The factories are the backbone which supports the town’s 1,000-strong Chinese community. Mauritania. A local worker at the Lem Seafood factory trims fish. On average, the factory goes through 200 tonnes of fresh fish per day. Photo: Liu Yuyang / Greenpeace. Mauritania. A local fisherman unloads at a Chinese factory. In recent years, the Mauritanian government has been encouraging the development of the fish meal industry and Chinese investment in it. Photo: Liu Yuyang / Greenpeace. The fishing industry in west Africa is just one example of China’s new role as a force shaping 21st century Africa. As China’s influence across Africa grows, pressure will increase on resources and communities across the continent. Tom Baxter and Pan Wenjing are an international communications officer and senior forest and oceans campaigner at Greenpeace East Asia.